The Tour of Flanders or Ronde of Flanders (Dutch: Ronde van Vlaanderen) is the most important road cycling race held in Flanders/Belgium each spring, a week before the Paris–Roubaix road race. It is part of the UCI World Tour and one of the so-called monuments of the European professional calendar. The 2015 Tour of Flanders will be the 99th edition of the tournament and is scheduled to take place on 5 April 2015. The route for the 2015 race will be largely the same as the 2014 course but with two added climbs in the first half, the Tiegemberg and Berendries. The Tiegenberg opens the show being the first of 19 climbs and the Berendries marks the eighth climb of the day. The final 150 kilometres will remain the same, with three loops around Oudenaarde. Totally 825,000 spectators are expected and will make this great race what it is. There will be spectator villages on the Oude Kwaremont, Paterberg, Kruisberg and at the finishing line in Oudenaarde as the final 45 kilometres decide about victory or defeat. There will also be shuttles, large screens, sanitary facilities in sufficient numbers and varied catering offerings. 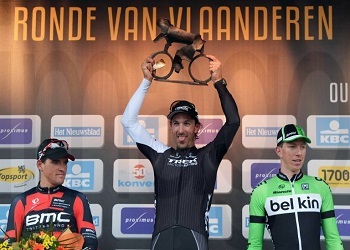 In 2014, Swiss rider Fabian Cancellara (Trek Factory Racing) won the race in a four-rider sprint finish ahead of Belgian trio Greg Van Avermaet, Sep Vanmarcke and Stijn Vandenbergh. It was Cancellara’s second victory in a row, and third of his career. The defending champion is heavily favoured to notch up another win (odds of 5.50) in Flanders before he will retire from the sport. Last year’s podium riders Greg van Avermaet (BMC, odds of 7.50) and Sep Vanmarcke (LottoNL.Jumbo, odds of 6.50) as well as three-time winner Tom Boonen (Etixx – Quick-Step) are considered to be among the strong contenders to challenge Cancellara. Another serious contenders to win the race and earn a place on the podium are Peter Sagan (odds of 5.50), Aleksander Kristoff (9.00) and Zdenek Stybar (11.00). The German riders have only little chance to win the race, according to the bookmakers. However, Gerald Ciolek and Marcus Burghardt are not without chances but they have high odds of 101.00. Heinrich Haussler, an Australian cyclist with German heritage, had a successful start to 2015, winning the road race at the 2015 Australian National Road Championships, and will be one of the dark horses in Flanders with odds of 51.00. We have compared the odds for the Tour of Flanders 2015 for you. This entry was posted in Sportsbetting news and tagged cycling bets, ronde of flanders odds, tour of flanders odds. Bookmark the permalink.